A large framed mirror is at the cornerstone of this artwork. Depicting a classic Victorian bathroom, this painting features an eclectic mix of styles and fittings specific to the era. The owners indulged in decorating the room with chic lamps, complementary mirrors and a multitude of plants. The artist uses watercolors to bring orderliness and elegance into the spotlight to enhance the Victorian design. 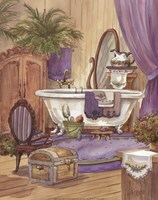 “Victorian Bathroom II” dazzles the eye with its warm colors and ornamented walls. The room is filled with objects that are supposed to reflect wealth, while still creating a functional bathroom. 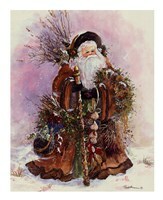 Just as the name suggests, this artwork is a perfect choice for decorating a bathroom. 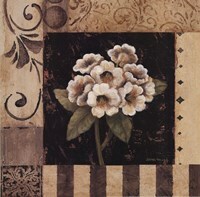 The beauty of the painting will be enhanced by a black or dark brown wooden frame.